Previously known as the CP-295N. The Synergy range of format converters provide solutions across the board in home and professional installation scenarios. The SY-P295N is designed to scale analogue video signal from a CV or SV source to a digital HDMI output, boasting a wide-range of HDTV and PC resolutions. Audio is combined with HDMI video output. This unit offers a selection of colour space and adjustment to obtain the best picture quality. v1.2 HDMI, HDCP 1.1 and DVI 1.0 compliant. Analogue to HDMI Converter Scaler with Audio. Video Support: Input - PAL & NTSC. Output Resolution Supported: PC: VGA, SVGA, XGA, SXGA, UXGA, WXGA, WSXGA, WUXGA. SD/HD: 480i, 576i, 480p, 576p, 720p, 1080i and 1080p. Audio Support: Analogue Stereo, Digital stereo PCM, DTS, and Dolby Digital. 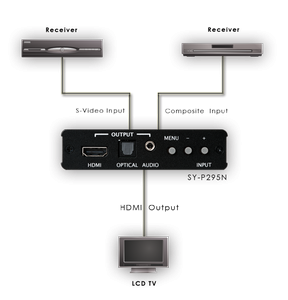 Simply select from the audio input source, this is then outputted to HDMI, Optical (Toslink), and mini-jack (stereo only) simultaneously. A comprehensive OSD menu provides picture adjustment on contrast, brightness, hue, saturation, sharpness, RGB (colour tone) level and aspect ratio size. Automatic detection of the connected screens factory setting, matching the resolution and refresh rate, when the NATIVE output is selected.